﻿ Thanks to the monopolisation that bands like Reel Big Fish have on the genre, there tends to be certain preconceptions when it comes to ska-punk. The image that forms tends to be of the permanently sunny, lively style peddled by shorts-wearing man-children that often sees it considered the most disposable of punk’s offshoots. And while that might be true of some of the biggest acts, especially when it comes to European-based acts like Lightyear or Sonic Boom Six, it often comes with a grittier, more overcast style that comes from a natural adaptation to the everyday surroundings. That geographical rift does seem to be a significant influence in how the sound and overall thematic presentation of the genre branches off. Just look at Jaya The Cat for a prime example, relocating from Boston to Amsterdam after their first European tour, and on fifth album A Good Day For The Damned, the brazen hooks and melodies might remain solid, but a significant amount of the vibrancy and beaming sunshine has been drained away. That’s not a complaint, though; if anything, Jaya The Cat tap into a maturity that does away with any notions of disposability, and with an added in-depth focus on the more wistful, personal moments of life, A Good Day For The Damned is a strong case for the near-unbreakable foundations that ska-punk can have and should display more often. Rarely is this encapsulated better than in Huddersfield Rain, particularly in the line “Summertime is takin’ a break / And we’re out there drinkin’ cider in the Huddersfield rain”. There’s the feeling of togetherness and living in the moment that the genre does so well, but alongside the less colourful imagery and the whirring organ powering along behind it, there’s greater weight and detail that comes from both instrumental and lyrical tones that don’t cross over into throwaway. This proves to be a common thread too, whether that’s in similar heartfelt declarations put to rainy European settings on Black Heart and The Streets Of Shoreditch, heavy-headed aftermaths of nights before on Wine Stained Futon and Sweet Eurotrash, or social commentary on A Rough Guide To The Future and The Palm Reader’s Face Looks Shocked that might feel slightly out of place, but still manages to serve a purpose. Of course, which tracks actually end up sticking can be a bit hit-or-miss. Having fifteen tracks certainly doesn’t help matters in that department, and from ideas that are reused wholesale to tracks that are just unable to leave an impression (particularly in the second half), A Good Day For The Damned ends up feeling more bloated than it should. The fact that Jaya The Cat pretty much run the gamut of their instrumental tricks long before the runtime ends is a similarly bad sign about the longevity that this album really has. That said, the fundamentals of the sound do really work, a combination of punk, ska, reggae and dashes of electronica that’s never too broad and can slip into some warped, seedier tones when needed that offer some refreshing edge, like on opener Wine Stained Futon, and alongside Geoff Lagadec’s hoarse, hoary burr, Jaya The Cat do feel distinct when viewed with their contemporaries. But for what feels like a long album as it is, turning back to the same rubbery grooves and the same thematic ground reveals that distinction as by virtue of other acts rather than themselves; their sound just isn’t as malleable to the point where they could tackle more ideas than they do. That’s probably what hurts A Good Day For The Damned the most, a lack of real branching out that holds back a ska-punk album that breaks away from the norm into something more real. It’s still good, mind – Jaya The Cat have their foundations locked down, and from the consistent evidence here, it’d be wrong to say otherwise – and even if it doesn’t soar to the heights of true greatness that it shows every capability of doing, this is an album that remains a mostly interesting listen in a genre that many have dismissed as having run its course a long time ago. It won’t change the world by any stretch, but it’s lightweight and easy enough to get along with that it does just fine regardless. 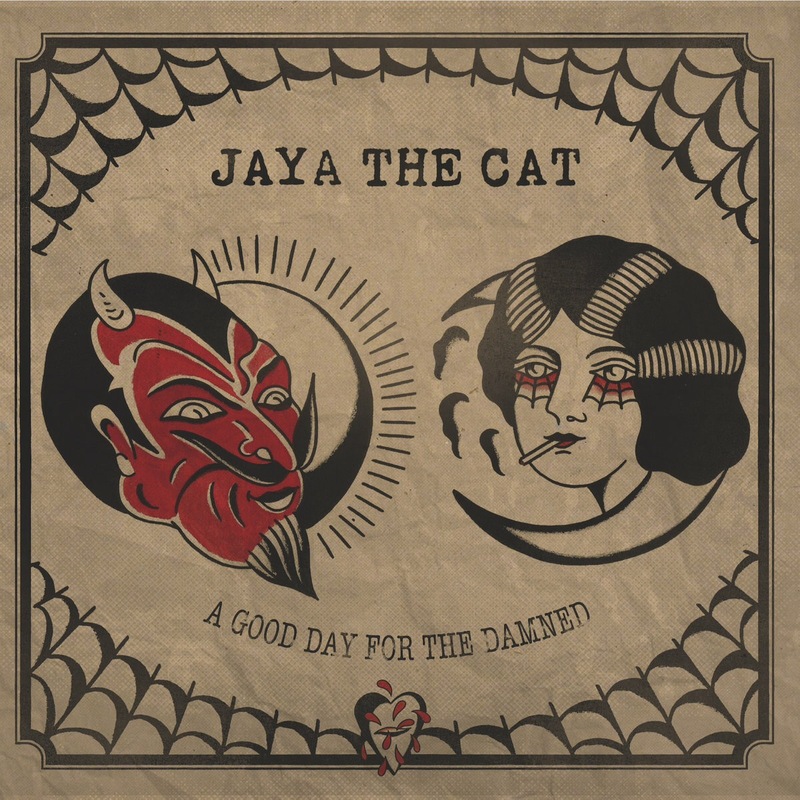 ‘A Good Day For The Damned’ by Jaya The Cat is released on 17th November on Bomber Music.